This Fall, Revlon has curated a number of fun city-themed beauty looks based around their popular ColorStay line. With New York, Paris, and Stockholm among the available options, I was very curious to find out which look would be arriving in the mail for me... I'm sure you can imagine my delight, therefore, at receiving the opportunity "jet set" off to Shanghai (via makeup, of course). I visited the city a few years ago and absolutely loved it! 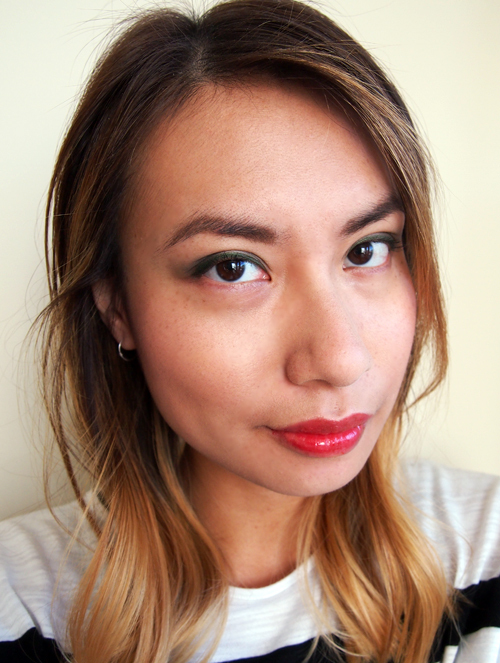 This "Shake It Up In Shanghai" FOTD features a deep green smoky eye, which is a departure from the basic cat-eye liner I've been sporting lately but nonetheless an incredibly wearable alternative. I started by using Revlon ColorStay Shadowlinks in Moss (inner corner to centre of the eye) and Khaki (outer corner). Next, I applied Revlon ColorStay Eyeliner in Jade, using the smudger end to blend out the liner and finished with Revlon Bold Lacquer Mascara in Blackest Black. To complete the look, Revlon ColorStay Moisture Stain in Shanghai Sizzle adds the perfect shiny red lip. For an easy but fun mani, I used alternating shades of Revlon ColorStay Gel Envy in Checkmate and Blackjack topped with Diamond Top Coat. If you haven't tried these polishes before, they dry super shiny and lasted an entire week without chipping. This colour combo, though neutral, is also sure to attract attention. I was actually surprised at how many compliments I received, from friends to random strangers in coffee shops. WANT TO WIN A REVLON JET SET TO SHANGHAI PACKAGE FOR YOURSELF? All you have to do is follow me on Instagram and "like" this picture. Winner will be randomly selected from my followers/likers (Canada-only, must be 18 years or older). Giveaway ends October 15. Good luck!! The look you created with it is absolutely wonderful! love ur nails and lips!!! xO!